Abstract: We, humans, envy the level of complexity found in Nature, but we tend to regard its replication in human-made systems as an unattainable goal. This perception of un-unravelability of complexity is strongly biased by our dependence on, as well as the successes of, the deliberate linearization and suppression of noise that is pervasive in engineered systems. Can superior structures and functionalities, which are difficult or even impossible to achieve with linear and deterministic systems, be obtained by exploiting nonlinear dynamics far from equilibrium? Could control of complex systems, at times, be “simple”? 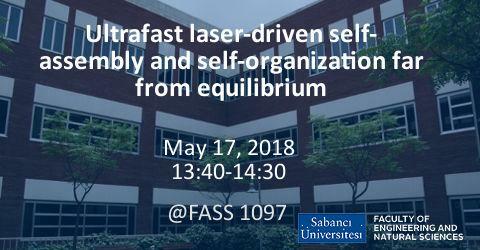 After giving a brief historical introduction to the complexity science, I will introduce ultrafast lasers as an excellent tool to control complex forms and functions by creating well-controlled spatio-temporal thermal gradients in far-from-equilibrium settings: Nonlinear interactions give rise to multiple fixed points in phase space during the dynamic evolution of the system. Each of these steady states correspond to a different pattern and their bifurcations. Amplified fluctuations, as a result of far-from-equilibrium dynamics, spontaneously drive transitions through bifurcations. Positive and negative feedback support exponential growth of perturbations, and their stabilization, respectively. This, in turn, allows control of great many degrees of freedom through the control of just a few. As concrete examples, I will demonstrate emergence of complex patterns and dynamic behavior from self-assembled polystyrene colloids (Nature Commun., 2017). I will also argue that this is a "universal" dynamic self-assembly methodology by showcasing four different microorganisms, namely, S. cerevisiae (immotile, about ~7 µm large, and elliptical in shape), M. luteus (spherical in shape, ~500 nm in diameter), E. coli and P. aerugosa (motile, rod-like with dimensions of ~1 µm x 2 µm), sub-5 nm particles and cancer cells (immotile, about ~40 µm large). Finally, I will briefly show how we create self-organized nano and microstructures (Nature Photon., 2013 and Nature Photon., 2017) by invoking nonlinearities in the form of positive feedback between laser beam-induced changes in the material and material change-induced effects back on the laser beam. Bio: Dr. Serim Ilday received her Ph.D. degree in Micro and Nanotechnology from Middle East Technical University, Ankara, Turkey, in 2014. She worked as a Research Scientist in the Physics Department at Bilkent University, Ankara, Turkey, from 2014 to 2017. In December 2017, she joined took a faculty position also at Bilkent University. Her research focuses on self-assembly, self-organization, complexity, far-from-equilibrium thermodynamics, nonlinear and stochastic dynamics, adaptive hierarchical materials, emergent phenomena. Her work has been published in prestigious journals including Nano Letters, Nature Communications, Nature Photonics, and recently highlighted in the media including Phys.org, MIT Tech News, Science Daily, IEEE Spectrum, Optics & Photonics News and Nanowerk.